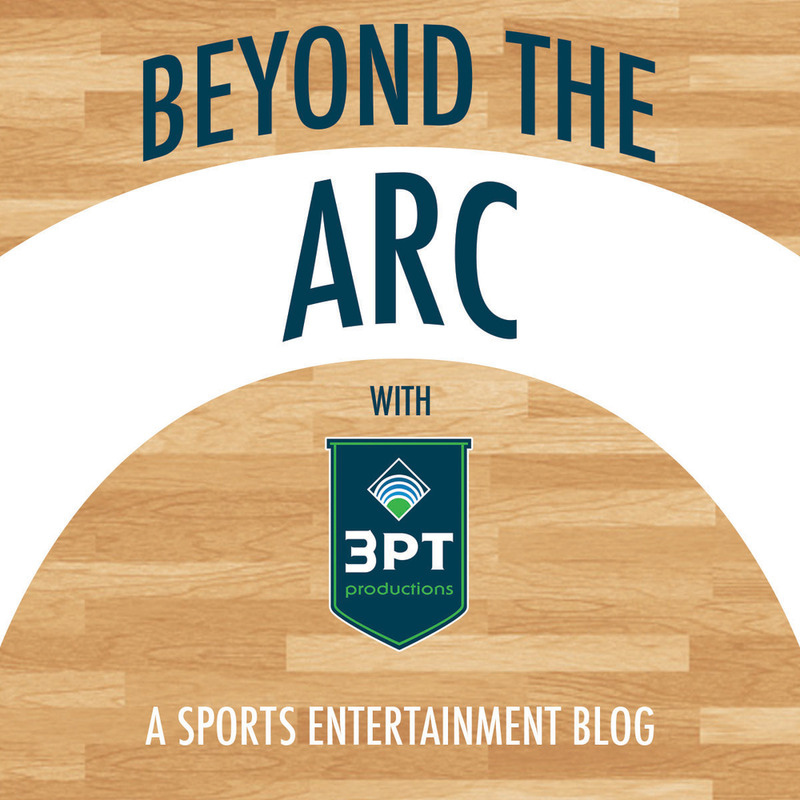 With the turn of each new year comes one of the greatest 3 Point Productions traditions, our year-end installment of 3 Points of View. Alongside myself, this year's round table included Patrick Walker, Derrick Gomez & Scott Smith as we collectively reflected on the highlights of 2016 and shared our thoughts on industry trends to watch in 2017. Which industry trends did you enjoy most in 2016? The 2016 Pac-12 China game featured Harvard vs. Stanford at Mercedes Benz Arena in Shanghai. Patrick: The globalization of American sports continues to excite me. It began years ago with the NBA Global Games and has evolved to include the NFL games in London and Mexico City, the Pac-12 hosting college basketball's annual tipoff in Shanghai, and college football teams taking games overseas to places like Dublin and London. Gameday experience in American sports has long been at the forefront of industry and it's exciting to showcase this atmosphere across the globe. Matt: Like all of the great ideas in the sports industry, the concept of real-time, scenario based sponsorship activations is spreading like wildfire - and evolving. The famed "Chick-fil-A Fowl Shot" promotion has spawned a new form of sponsorship activation that's highly coveted by game producers. Since the promotion is built around a moment in the game, it doesn't carve much, if any, inventory from your in-game timeouts or breaks. The more powerful and intriguing part of the promotion is how it engages the fans while reinforcing the behavior desired to create home court advantage. I've seen examples in NBA markets that now play with this concept throughout the entire game rather than just the 4th quarter. We'll wait and see if over-saturation spoils the trend or only makes it stronger. Derrick: The year 2016 seemed to be all about localized content. If you follow a team on social media, you can now see everything the team is doing, from game highlights to interviews or quirky entertainment elements. There are numerous outlets for a team to demonstrate its personality, thus, it only makes sense for teams to try to centralize its output to maintain a sense of personality that fans can relate to. This is where the industry trend is growing - in the drive for localized content. For example, you can now watch an NBA game through NBA League Pass as though you were actually there - instead of commercials during timeouts, you see the inflatable mascot skit that is happening live in that arena. Or, you can see the local Memphis break dance crew that only performs in or around Memphis. The ability to localize and coordinate content while gearing it towards your fans while trying to outreach to the next fan is a tricky balance that some teams are starting to get the hang of. What were your favorite event experiences of 2016? Patrick: One of my favorites of 2016 took place over the course of the summer. With the organization that runs the Phoenix Suns, Phoenix Mercury and Arizona Rattlers making a change in leadership for their Game Presentation department, I split time between Seattle and Phoenix to serve as their department head on an interim bases. In addition to calling games and producing entertainment, I assisted the organization in a nationwide search to find the right person in the industry to lead the teams on a permanent basis. Derrick: As were most people's favorite experiences of 2016 - the Mannequin Challenge. While in China, following the Pac-12 game between Stanford and Harvard, we pulled the staff together for a post-show Mannequin Challenge. Our casting skills should be noted, including Pac-12 Directors, local talent, oh, and I almost forgot, the masterpiece concluded with an appearance from Bill Walton in his tie-dye Pac-12 tee! Scott: Working alongside Wasserman with the NBA on the unveiling of Dew NBA 3X was definitely a highlight of 2016. Since it was a new event, we were able to explore a variety of entertainment options in each city to see what fit best for the brands. At the various locations we played outdoors, indoors, once with a massive videoboard and a few with live music performances. With a mindset of continual improvement, the entire staff formed an exciting team-oriented culture that is sure to enhance the events again next year. Which 2017 projects are you most excited about and why? Patrick: I'm excited about our growing partnership with the Pac-12. We had an incredible experience producing the Pac-12 China Game in Shanghai this past November and they are a forward thinking organization that thinks outside the box in many facets of their approach to fan experience, which is music to our ears as entertainment producers. Plus, I've been a fan of the Pac-12 for many years as a Washington Husky alum! Seattle is set to host the 2017 WNBA All-Star game at KeyArena on July 22. Matt: There's something about planning for a full season worth of games that really excites me. This is why I cannot wait for the beginning of the 2017 WNBA season so we can resume our role as the official game presentation partner of the Seattle Storm. With one of the youngest and brightest cores in the league, there will be plenty of excitement shouting through the walls of KeyArena this summer. As the players start their journey to a title, we'll look to reclaim the title of greatest home court advantage in the league - and we'll have some fun along the way. Oh, and have I mentioned that Seattle is hosting the 2017 WNBA All-Star Game? I've been waiting for this for a long time! Derrick: Right off the bat, I begin 2017 with a trip to Mexico City. There, the Phoenix Suns will have two "home" games, one against the Dallas Mavericks and the other against the San Antonio Spurs. I look forward to this event because it will mark the first time we at 3 Point Productions are contracted strictly for behind the scenes work: production management. I am hoping for a good experience that will lead to more opportunities in this field for the 3 Point team. Which industry trends do you hope to see develop in 2017? Patrick: In 2017, I look forward to the continued growth of high profile neutral site events, with teams and universities looking for alternate sites outside of their home venue to host a game and play in front of a unique audiences. Companies like ours serve as great fan experience support for these types of events. A good example of this was the 2016 CBS Sports Classic, featuring four powerhouse college basketball programs and a new partner for us to work with in KemperLesnik. Scott: I recently tried on my first virtual reality headset and immediately understood why professional sports leagues are so interested in incorporating VR into the fan experience. VR has the power and capability to redefine fan experience. These wearable technologies will allow fans to interact with their environment and customize their viewing experience in ways we could not have previously imagined.